This is the first fine woodworking project that I attempted. Built of solid ash with a dark walnut stain finished with multiple coats of shellac. Legs- I ordered 3″ squares for the legs from the lumber yard. They arrived in fairly good shape, just needed a little surfacing, then I cut them to size. Then I cut the mortises (morti?) in all the legs for a total of eight. Aprons- the aprons consist of 2 long front & back aprons, and 2 fairly short side aprons. After milling the lumber, next I cut the tenons on all four pieces. Looking back, I should have figured a better way of cutting the tenons on the long aprons. There just wasn’t enough ceiling height, and it was a little dangerous to try and hold them steady…even with tenoning jig on my table saw. The last task on the aprons was to cut biscuit slots to receive buttons to attach the top. Top- the top is pretty much standard. I glued up a couple boards based upon grain direction. I eased all edges with some 220 sandpaper. The top is attached with some shop made buttons that fit into the biscuit slots I cut in the aprons to allow for wood movement. Shelf – the shelf is basically like the top, except it has a notch at each corner where it meets the legs. I cut the notches with a jig saw. Shelf supports- I made some square blocks, and then cut a standard curve for the bottom edge of the support. I cut the curve on a scroll saw and sanded to the line with a drum sander. Finish – dark walnut oil based stain followed by 5 coats of shellac. I used a standard walnut stain manufactured by MinWax, and an amber shellac out of the can by Bullseye. 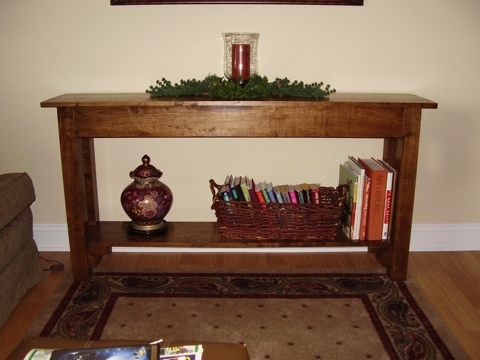 This entry was posted in furniture by villagecustomfurniture. Bookmark the permalink.